Warning: There’s an explicit lyric. You have been warned. This is part of a series I’m doing on the tracks on the new EP, Baltimericana. To read the other parts of this series, simply click on the tag “Song Sources” above. To be honest, I don’t remember the writing process for this one too well. I think I started writing it after I noticed a sign for a fallout shelter one of the buildings near work that says the capacity is 1250, and it was almost certainly influenced by Josh Ritter’s “Temptation of Adam” (if you’ve never heard that one, it’s is lyrically perfect and one of the best songs I’ve ever heard). I do know that my wife had been playing Fallout 3 a lot around the time I wrote this, so that might have had something to do with it. Baltimore still has a one o’clock whistle, which is an old air raid siren that’s played on Mondays at 1:00 in the afternoon. What little reading there is to do on the subject leads me to believe that this is in fact one of the many strange things about our city. Also, there are supposedly 112 of them. (Not a primary source, there, but there’s a picture of it.) I don’t remember hearing it in other places I lived, but the only other large city I’ve ever lived in was San Antonio, and I lived on the outskirts and worked in a windowless building, so who knows. I’ve also got what might be an invented memory of us actually doing the duck and cover under a school desk like you see in old films. I think it must be invented. I can’t imagine anyone actually doing that, like, ever, because I can’t imagine anyone ever thought radiation doesn’t just fall straight downward, then you can just clean it up with a dustbuster or something. Lyrically, I can’t say this is my favorite thing on the album and there were a couple lines I thought were awkward (but Joe liked those lines, so, as usual, what do I know?). It’s about a weird guy who built a fallout shelter in his back yard because he doesn’t believe the cold war ended because the one o’clock whistle still goes off every Monday. This is pretty much a straight-up punkish rock and roll song. The verse is more on the rock and roll side and the chorus is more on the punk side. That’s it, just keeping things simple. The real fun was in recording this one. There’s a bunch of found percussion here, including a chain being dropped on the floor, banding on a cardboard box, turning an antique egg beater against something metal, and some stuff I’ve probably forgotten now. We also did some weird things with microphone placement. We were recording in Joe’s basement (instead of the living room or office like the other songs), and Joe got the brilliant idea to stick a microphone in the drier. It’s not just color; the main lead guitar track you hear is from the microphone in the drier. It gives a really cool natural reverb with a lo-fi sound. Some of the vocal tracks are recorded the same way. The only amp used on this was was different sides of the Tone King imperial, set up in a few different ways depending on what guitar sound we needed. For guitars, we used the borrowed 1956 Gibson for most of the the rhythm tracks (one time run through a Screwdriver fuzz clone for distortion), and most of the lead guitar tracks were the Don Quixotecaster through one of my Clipper Ship Overdrives. 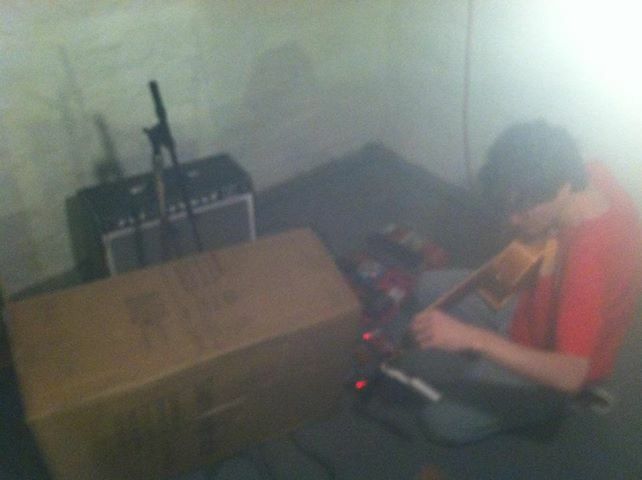 Some of the rhythm overdubs were done with my red Telecaster. There are two bass tracks on it, one of which is clean (direct) with an envelope filter (auto-wah) plugin on it and the other is run through a clone of the Pearl Octaver I built (Madbean’s Lowrider), which let me get some dirty bass sub-octave nonsense going on. I’m not sure how useful that was in the end based on the way I mixed it to sound more lo-fi, but I think it does fill out the track. There’s some other stuff going on here. The one o’clock whistle recording was done on my sister’s phone (thanks, Becky!). There’s a kinda creepy siren sound in the background that was created by self-oscillating my Malekko 616 delay pedal and timing the modulation to make the pitch go up and down. We just fed a note into it and the delay pedal did the rest. We also managed to record some radio coming through one of my fuzz pedals. It was a preacher on AM radio, and it lasted for about 5 minutes and we could never get it back again, even the next day at the same time. Joe pored through everything the preacher was saying and managed to extract something that sounded like 1, 2, 4, 9 (the number of people there’s room for in the fallout shelter), and mixed that in fairly low on a loop near the end of the song. (It’s in there earlier a couple times, too, but never really intelligible). The vocals don’t really have too much going on, but I did end up stacking them in the mixing process. I added a take gradually at different intervals, so it starts off with just one take at first and ends up with several stacked takes at the end. I did have to “create” some extra people since Joe and Katie didn’t sing any harmonies on this, so I cheated and doubled the tracks a fourth and octave up on some lines. There’s also some hipster “Hey” with gobs of reverb in there, you know, for the tight jeans crowd. I hadn’t been too excited about doing this song, but I’m glad Joe picked it as one of the four to record. It ended up having more of the elements I originally envisioned for the EP: it’s more aggressive/rock oriented than most of what I’d do with Midway Fair, it uses a phone recording, it’s got a lot of noise elements, and the themes reference something with local flavor. now I go to work in a fallout shelter. Hey, man, I wish we grew out of being scared. All you kids today I don’t imagine you’d care. Which did they expect me to hear? I sang along to its song every week for thirty years. And the automatic spread of an irrational error. Now, when did they ever fight clean? very cool , i would pick this as my personal favorite , subjectivity ! Thanks, Petey. I think Joe said it was his favorite of the four, too.